Ningunsaw Park covers low elevation forested slopes, riparian areas and lake-headed rivers which, along with adjacent Ningunsaw River Ecological Reserve, protects a complete elevational sequence of ecosystems from the Ningunsaw River valley to alpine. Backcountry recreation, such as skiing, is available. Travelers on Highway 37 may see grizzly bears, as high value habitat is found in the park. Ningunsaw Park lies directly west of Highway 37, 120 km north of Meziadin Junction and 215 km south of Dease Lake. History: Ningunsaw River Ecological Reserve was protected in 1975 to preserve an elevational sequence of biogeoclimatic zones in a transitional climate. Ningunsaw Park was established in 2001 as an extension of this sequence, protecting the lower elevation valley bottom. 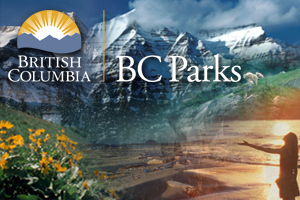 Designation of the park followed the recommendations of the Cassiar Iskut-Stikine Land and Resource Management Plan. Cultural Heritage: Ningunsaw Park lies within the asserted traditional territory of the Tahltan First Nation. The historic Telegraph Trail passes through the park and was used from 1899 to the mid-1940s. Conservation: Ningunsaw Park is within the Northern Skeena Mountains Ecosection and, along with Ningunsaw Ecological Reserve, protects a complete elevational sequence of biogeoclimatic zones from ICH to ESSF to AT. The complete protected sequence of ecosystems provides an ideal setting for education and research. Wildlife: High value grizzly bear habitat is found on avalanche chutes in the park. The wide range of ecosystems provides habitat for many mammals and birds. The management direction statement for this park was approved in March 2003. Hunting is permitted within Ningunsaw Provincial Park. Please refer to current B. C. Hunting Regulations for seasons and bag limits. Note: Hunting is not permitted within the Ningunsaw River Ecological Reserve. Fires should be used sparingly, as they are among the most serious visual impacts in the backcountry. Always carry a stove; use it for most, if not all, of your cooking needs and only build a fire when it is safe and will not cause further damage or deplete wood supplies. Please check for campfire bans and the Fire Danger Rating for the area you are visiting before igniting a fire in the backcountry. Limited burning hours or campfire bans may be implemented. To preserve vegetation and ground cover, please don’t gather firewood from the area around your campsite or elsewhere in the park (this is a ticketable offence under the Park Act). Dead wood is an important habitat element for many plants and animals and it adds organic matter to the soil. For more information about campfires in the backcountry, click here. Wilderness, backcountry or walk-in camping is allowed, but no facilities are provided. Please note that camping, hunting, fishing or campfires are not permitted within the Ningunsaw River Ecological Reserve.